SHOPPERS couldn’t believe their eyes yesterday when they saw what looked like an old man floating perfectly still in mid-air at the intu Braehead shopping mall. But the statue-like figure was actually ten-year-old schoolboy, Lauchlan Muir who was raising money for the BBC’s Children in Need charity appeal. The youngster has collected more than £3000 for this year’s BBC Pudsey appeal by turning himself into a floating human statue and doing absolutely nothing for three hours. Passers-by looked on in amazement as they tried to work out how the grey and silver painted boy could appear to be floating on air in the middle of the shopping centre. But they were soon digging deep to put money in his charity collection bucket. Last night Lauchlan was keeping tight-lipped about how he achieves the amazing stunt, but explained how he manages to keep still for up to three hours. He said: “I’m not going to say how I appear to be floating on air, as that would take all the mystery and amazement out of the stunt. And when it comes to keeping still for so long, I suppose I’m just very determined and I think about all the children I’ll be helping by not moving and collecting money for the charity. “And I’ve got say a big thank-you to intu Braehead for letting me come into the shopping centre and collect money for Children in Need. “The reaction from people who see me as a statue floating in mid-air is amazing. When they first see me you can tell by the look on their faces that they’re not sure if I’m real or not. Lauchlan, who attends Bo’ness Public Primary School, started raising money for Children in Need after he won a Pudsey Bear in a raffle when he was five and began organising raffles. But during a holiday in London he saw a living statue street performer and was so impressed, he wanted to pull off a similar stunt for his next fundraising effort. This is his third year raising money as a living statue after Lauchlan’s dad, John set to work to make it happen. John said: “It was all Lauchlan’s idea and I just did some research into how you achieve the illusion. His mum, Kerry and I are very proud of him and what he has achieved. 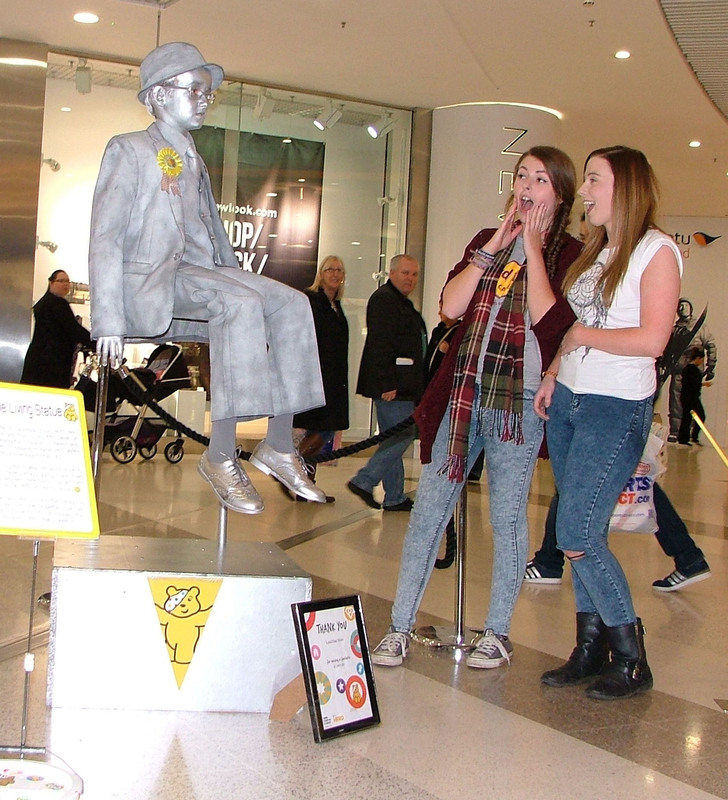 Community development manager for intu Braehead, Lydia Brown said: “Lauchlan’s an amazing boy and our shoppers loved him – after they got over the shock of seeing what appeared to be a statue of an old man floating in mid-air.